Cake base recipe adapted from Valli Little's Delicious: Simply the Best. Chocolate Mousse recipe adapted from Raymond Blanc Delice de Chocolat. Chocolate Lace Cookies adapted from Martha Stewart. To make the cake, preheat the oven to 180 celsius (355 Fahrenheit) and grease and line a 24cm spring form tin with baking paper. Combine the chocolate and butter in a heat proof bowl and sit over a saucepan of simmering water and stir until smooth. Remove from the heat and set aside to cool slightly. In the bowl of an electric mixer whisk the egg yolks until very thick and pale and then gently fold in the cream, Chambord or other berry liqueur and cooled chocolate. Set aside. In a separate bowl whisk the egg whites and cream of tartar until it forms stiff peaks. Add 1/3 of the egg whites to the chocolate and egg yolk mixture and gently fold through. Repeat with remaining 2/3 until combined. Pour into the prepared cake tin and bake for 35 to 45 minutes, or until a skewer inserted into the center comes out with a few moist crumbs. Set aside to cool completely in the tin on a wire wrack. To make the mousse heat the milk and cream in a saucepan. As you are doing this whisk the egg in the bowl of an electric mixer until it is frothy and then pour in the milk and cream mixture. Continue to whisk for a minute before returning to the heat (turn the heat down to low). When the mixture is thick enough to coat the back of the spoon add the chocolate and Chambord and stir until smooth. With the cake still in the tine, pour over the top of the cooled cake and leave in the refrigerator overnight to set. To make the lace cookies preheat the oven to 175 degrees celsius (350 Fahrenheit) and line a baking tray with baking paper. Combine the sugar, butter and glucose syrup in a saucepan over a medium heat until the sugar is dissolved and the butter is melted. Add the cocoa, flour and almond meal and stir to combine. Drop teaspoon sized dollops of the mixture onto the prepared baking tray and bake for 7 to 8 minutes. Let the cookies sit for a minute before removing from the tray with a spatula and rolling over a rolling pin to achieve the curved shape. Leave the cookies to set (this will only take a couple of minutes). For the chocolate glaze place the cream in a saucepan and bring to a boil. Place the chocolate in a separate bowl and pour the cream over the top and set aside for 5 minutes. Then stir until smooth. Un-mould the cake and sit it on a wire wrack and line underneath the wrack with baking paper. Using an instant read thermometer check the temperature of the glaze. When it is between 95 to 104 degrees Fahrenheit pour over the top of the cake. Combine the blueberries and caster sugar in a bowl and swirl to coat the blueberries in the sugar. 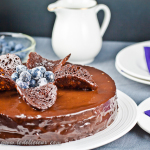 Place the sugared blueberries in a circle in the center of the cake and surround with the lace cookie petals. The cake will puff up dramatically in the oven and when removed will collapse in the center. Using a sharp knife trim the edges to achieve a flat surface for the cake. When making the chocolate glaze try not to over stir the mixture as this will cause the glaze to lose it's shine. To easily glaze the cake the temperature of the glaze should be between 95 to 104 degrees farenheit as this glaze will flow easily and glide over the top of the cake.